The Nissan Skyline GT-R (R32), released in 1989, was developed as a base machine for Group-A races. Taking full advantage of its powerful 2.6l, 6-cylinder, twin turbo engine, it was equipped with a 4WD system. Originally designated as R32, the car was termed R33 in 1995 and R34 in 1999. In October 2000, the Skyline underwent minor changes such as the addition of large rear brakes to upgrade performance further. This new evolution was called the V-spec II. The most drastic alteration was the replacement of the aluminum hood with a new carbon hood featuring a NACA duct. The carbon pattern of the hood would stand out even when painted the same color as the car body. Both inside and outside surfaces of the hood were designed using RTM, a new construction method yeilding smooth surfaces. The V-spec II also features the previous improvements of the V-spec: front/rear diffusers and 18-inch tires, brake discs with Brembo calipers, and a 6-speed transmission. In February 2002, Nissan released a limited edition car called "Nur", named after the Nurburgring circuit, and equipped with an N1 racing specification engine. Combining the impressive specifications of both the V-spec II and the M-spec, 1000 units of the "Nur" were produced in all. Marketed as the last GT-R to equip a straight 6 engine, all 1000 were sold-out in one day, attesting to its incredible popularity. The new 2000 gas regulation forced Nissan to end production of the GT-r in August 2002, however the glory of this ultimate sports car lives on. 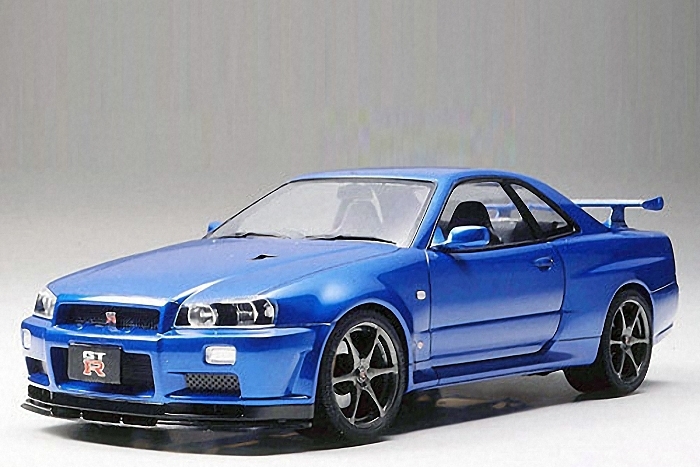 The Mettalic Chrome special Nissan Skyline comes with all the plastic parts molded in a chrome blue mettalic color.